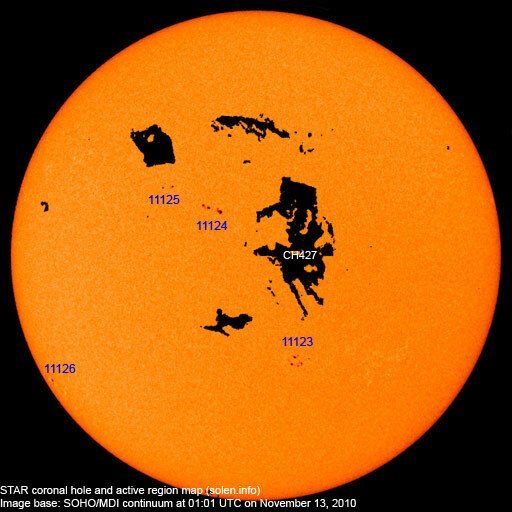 Last major update issued on November 13, 2010 at 05:40 UTC. The geomagnetic field was quiet to active on November 12. Solar wind speed ranged between 452 and 554 km/s under the influence of a high speed coronal hole stream. 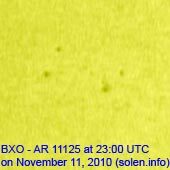 Solar flux measured at 20h UTC on 2.8 GHz was 85.4 (down 1.5 over the last solar rotation). The planetary A index was 15 (STAR Ap - based on the mean of three hour interval ap indices: 14.8). 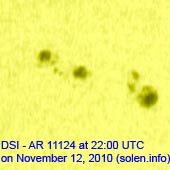 Three hour interval K indices: 43343222 (planetary), 44343212 (Boulder). 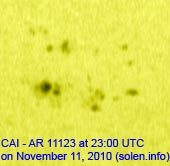 Region 11123 displayed no significant changes, however, flare activity ceased during the latter half of the day. 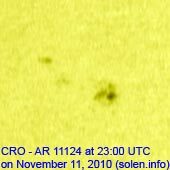 Flares: C4.6 at 01:34, C1.0 at 03:53, C1.1 at 05:21, C1.5 at 08:11 and C1.5 at 13:52 UTC. 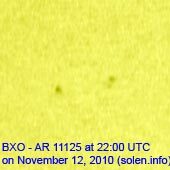 Region 11124 developed and added penumbra on both polarities. C flares are possible. Region 11125 developed slowly late in the day. 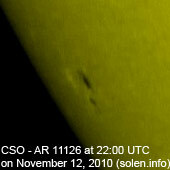 New region 11126 rotated into view at the southeast limb. November 10-12: No obviously Earth directed CMEs were seen in LASCO or STEREO images. 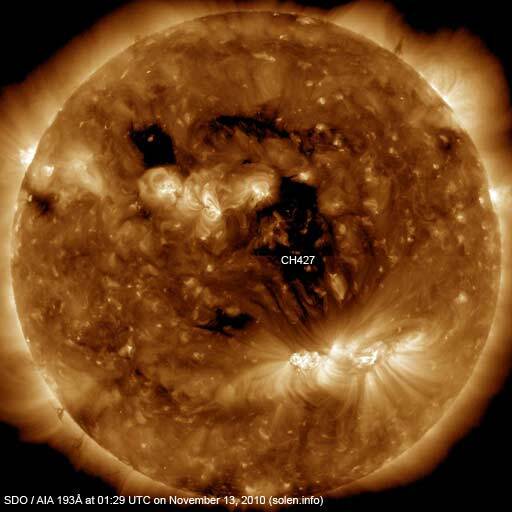 A trans equatorial coronal hole (CH427) was in an Earth facing position on November 11-12. 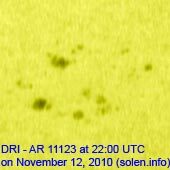 The geomagnetic field is expected to be quiet on November 13 becoming quiet to unsettled on November 14-16 due to effects from CH427.